Just over the weekend as I was scrolling through Facebook on my phone, an automated message popped onto my screen. 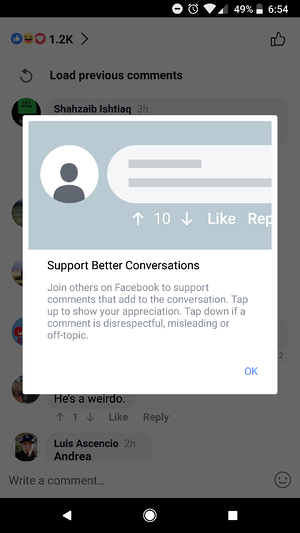 It said I could support better conversations on Facebook through their newest update to the website. Facebook informed me I can now tap down on a comment that I find disrespectful, misleading, or off-topic, or tap up if the comment was useful to me. If you have ever been on Reddit's website, you'll notice this system of up-voting and down-voting is run in a similar manner. Here is what we know so far about this newest update. If you are reading this and you have no clue what I’m talking about, don’t fret. It seems that Facebook has only rolled this functionality out to a select few users. The test is running for 5 percent of Android users in the U.S. with the language set to English. Since I seem to be one of the few, in our office at least with an Android phone, it explains why I saw this update and some of my coworkers did not. Since this is a short-term test Facebook claims it won’t affect the ranking of the comment, post, or Page as of now. It’s going to be used as more of a guide for Facebook officials to know if this functionality and feature are going to work out in the long run. When I tested out the feature myself it hid the comment after I down-voted it, and did nothing when I upvoted a comment. It told me that the user would not know I down-voted their comment and that there was no visible count on each comment on how many times it had been upvoted or down-voted. What Does Zuckerberg Have To Say About This? Back in January of this year, Zuckerberg released a long statement on Facebook about some of the changes coming in 2018, and there was a small disclaimer about this update. He said, “I’m changing the goal I give our product teams from focusing on helping you find relevant content to helping you have more meaningful social interactions.” I’m guessing this is one of those changes he was referring too. In my opinion, the future of down-voting a comment could lead to showing you less content from the people and Pages you downvote a lot, thus leading to more relevant content on your newsfeed. If this new update becomes a staple of Facebook, it could mean less organic reach for business Pages who get down-voted a lot. Since Facebook’s big dream is to make it easier to connect and share with the people who matter most to you, Facebook is going to show less content from your business page. The specifics of how it moves in this direction may injure publishers who’ve built up businesses overly reliant on Facebook. But it’s rare to see a public company announced it will immediately weaken its own business to give its customers a healthier lifestyle. We’ll all just have to wait and see how this affects us.